Human-Robot Interaction, physical Human-Robot collaboration. Model-based Control, Data-driven models, reinforcement-based robot control. Mechatronics Design, Global optimization methods. 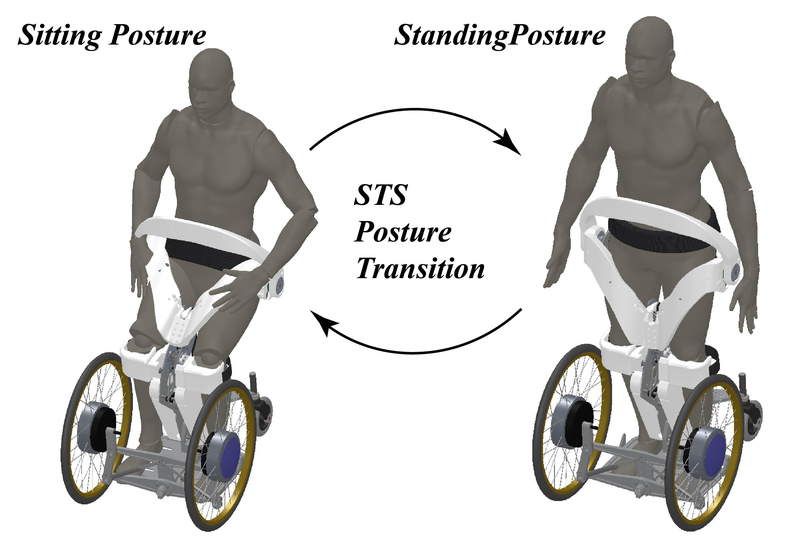 To regain the independence of lower-limb paralyzed people, we propose a standing mobility device for revolutionizing standard wheelchairs, without losing portability and compactness. We introduce a mobile exoskeleton combining powered actuators for mobility and passive actuators for assisting sitting-standing-sitting transitions through voluntary motions of the upper body. i.e., achieving a new mobility solution for the future that exceeds powered wheelchairs, transforming it into personal mobility with a wearable exoskeleton that uses an energy efficient method of mobilization. Moreover, we envision a future where people interact with each other with the same eye height, through standing mobility capable of standing and stair-climbing. Originally introduced at the AI Lab [see more here], this device will provide more than standing mobility in daily living, it will change the way the people see, feel and interact with the surrounding people and the world, changing both physiological and social aspects of everyday living, work and leisure activities for all people that have been forced to live seated. We introduce a unique intelligent system that relies on the center of mass (COM) motions for conveying the user’s intention, then through a smart passive mechanism that utilizes the user’s residual body functions at the upper body, we synchronize the lower and upper body motion providing the sitting to standing (STS) transitions. Furthermore, we propose the integration of a force-based interaction control for achieving the motion while standing, thus, providing a method of conveying the user’s desired motion intentions without the need of using hands or wearing any other controlling device, rather by upper body motions towards the desired directions. We aim to develop a control scheme for robot leading during human-robot interactions. Herewith, developing a robot that can communicate its intention of motion to a human partner while in direct contact. This project presents a physical Human-Robot Interaction under the lead of a robot, performing the role of teaching within a dance training framework. For doing so, close contact cooperation was designed to be intrinsically safe through a force-based controller that responds and adapts accordingly to the partner's abilities in the task. Herewith, balancing guidance in the training, and a comfortable interaction force for the human partner. Experiments with multiple subjects demonstrate a safe interaction guided by the robot, likewise improvement of subjects' abilities in the practice with the proposed robot control architecture. Dance Teaching by a Robot.